Tourism is a very important part of the Irish economy, and Spirituality is an aspect of life that is attracting more and more people, who are examining their very being. Now, thanks to the Spirituality Institute for Research and Education (SpIRE) and the Department of Languages, tourism and Hospitality at Waterford Institute of Technology, these two important topics have been brought together. On 9th March, the inaugural conference, “Pilgrimage and the Evolution of Spiritual Tourism” took place at Waterford DIT, attracting over 100 delegates. 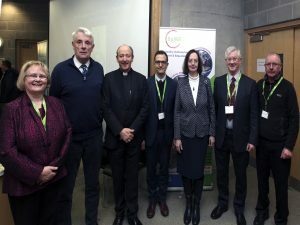 Key note speakers included Dr Dee Dyas, Director of the Centre for Pilgrimage Studies at York University; Dr Stefano Dominioni, Director of the European Institute of Cultural Routes based in Luxembourg; and John O’Dwyer, author and columnist and Chairperson of Pilgrims Path Ireland. 12 seminars took place in the afternoon of which delegates were able to attend three. Topics included the spirituality of tour guides, Hildegard of Bingen, understanding travel experiences as pilgrimage, management practices at pilgrim sites and Celtic Spirituality. Representatives from pilgrim sites and trails were also on hand to share their work with delegates. From the talk given by Dee Dyas, of particular note was visitors to cathedrals exploring the buildings and finding solace in the space and architecture. For many of the visitors, religion and spirituality had not been a factor in their lives but for many, such visits were stirring interest and there was a thirst to delve deeper. This in turns means that tour guides need to develop a language that reaches out to people who have no religious or spiritual background. Tourism Ireland has largely ignored the spiritual dimension of places of pilgrimage. One startling fact was that Knock welcomes over one million visitors a year but doesn’t even appear on the Bord Failte website. A need for more training for tour guides at religious sites. There is a need for them to be more aware of the religious and spiritual significance of the site in order to enrich the experience of the pilgrim/visitor. Dr Kevin Griffin from Dublin Institute of Technology in his seminar stressed the importance of the spirituality of the tour guide and how it affects the experience of the visitor to a sacred site. Pilgrim walks and trails are witnessing a renewed interest and numbers are increasing. Glendalough and Clonmacnoise are among places experiencing this surge in numbers. How are the venues, and we as a Church dealing with this and reaching out to the pilgrims/visitors? The conference certainly was a place to share common experiences and reflect on the future relationship between spirituality and tourism and it is hoped that the conference will serve as a springboard for further initiatives in spiritual tourism and academia, in particular a pilgrim tour-guide educational module designed especially for the Tourism and Hospitality department at WIT and a collaborative research initiative with the RIKON Research Centre at WIT.